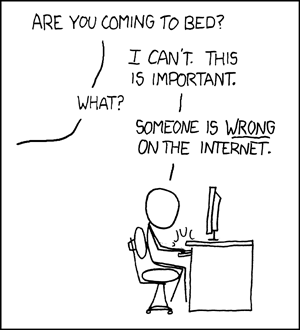 I have to admit that I only occasionally get the joke with XKCD, as I am not a techie or programmer. Today's cartoon, which I first saw on boingboing, is something that most people who spend any time online will resonate with. As I quite often say to my children as I tear them apart... sometimes it doesn't matter who is right, you just have to agree to differ. It's hard to remember sometimes though, very hard.